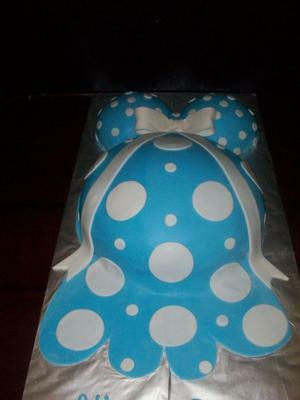 This baby bump cake was made for a baby shower. I iced the whole thing with light blue buttercream icing. Tint some fondant light blue and roll out to 1/4" thick. I placed the rolled fondant over the whole cake and smoothed it around the breasts and belly. Cut out along edges with a fondant cutting tool and cut along bottom so the frills from the dress are formed. I cut circles out of white fondant using the small and medium circle fondant cutters. I put the small circles on the breast part of the dress and the medium and small on the skirt. I made a fondant bow a day ahead of time and placed that on the chest above the belly. Cut out the bow's tails and place under the bow and drape across the belly. This cake was a huge hit and have had several requests for it! that was such a cute cake. you did a great job..nicely done.very clever. I've seen these before but haven't tried one yet.